Recently bereaved, former foul-mouthed comedienne Maria Peters has found God, is trying to make a comeback, and is convinced that someone is stalking her. 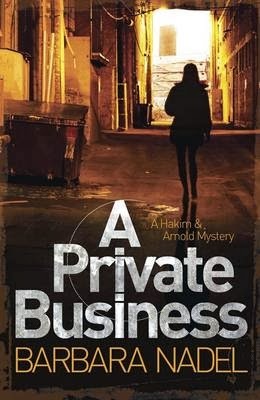 She turns to a former cop turned private investigator, Lee Arnold, who has just hired Mumtaz Hakim as his assistant. Lee and Mumtaz have problems of their own. Lee’s business is struggling and his brother is an alcoholic who’s making his mother’s life difficult. Mumtaz’s husband was recently murdered and she’s been left with a sixteen year old step-daughter and enormous debts that threaten their home. Lee and Mumtaz take on the case, but despite close surveillance can spot no interference in Maria’s life except her own paranoia. As that grows she is drawn closer to a born again church and becomes ever more withdrawn and skittish. The question is whether her concerns are real or delusions? The real strengths of A Private Business is the characterisation, contextualisation and social interplay between characters. Nadel has created four strong lead characters in former cop, Lee, Muslim widow, Mumtaz, divorced and world weary cop, Vi, and former alternative comedienne, Maria Peters. The plot focuses as much on their own lives and troubles, and the various forces shaping them, as it does the investigation, and this is a definite plus rather than a distraction. They are genuinely interesting characters with fleshed out back stories and social networks. The story itself is relatively straightforward and its clear from very early on what is happening; it’s more a case of how it unfolds and resolves than a puzzle. My impression on finishing the story was that it would be perfect for a television adaptation. I’m looking forward to reading the second book in the series.